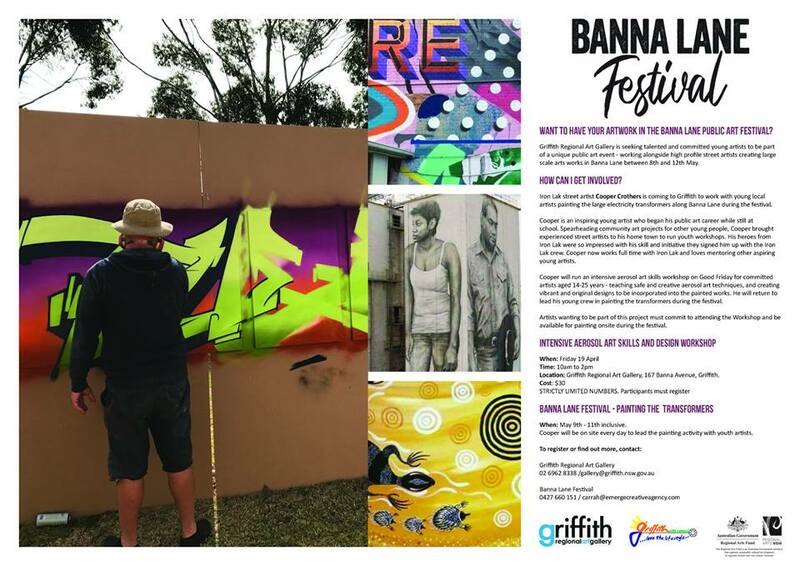 Want to have your artwork in Griffith’s Banna Lane Public Art Festival? Griffith Regional Art Gallery is seeking talented and committed young artists (between the age of 14 - 25) to be part of a unique public art event - working alongside high profile street artists creating large scale arts works in Banna Lane between 8th and 12th May. Cooper Crothers will run an intensive aerosol art skills workshop on Good Friday for committed artists aged 14-25 years - teaching safe and creative aerosol art techniques, and creating vibrant and original designs to be incorporated into the painted works. He will return to lead his young crew in painting the transformers during the Banna Lane Festival.